I'm very envious. I'd love to be able to experience enjoying motorsport in a well prepared car such as one of those rally SLCs however my budget doesn't extend that far. I am happy to just be able to enjoy my stock 500SLC in classic and historic rallies here. 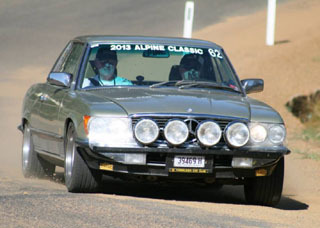 It would be nice for all the motorsport enthusiast MB owners to get together at something like the Bathurst Easter meeting, even if not all were there to actually compete. We should see what interest there is and get something organised. Greg in Oz wrote: I'm very envious. I'd love to be able to experience enjoying motorsport in a well prepared car such as one of those rally SLCs however my budget doesn't extend that far. I am happy to just be able to enjoy my stock 500SLC in classic and historic rallies here. Octagon (targa orgainsers ) have become rather a pain so we are not intending on running Tassy next year. anyone else be a starter or just wnat to join in as pit crew or something? anyone else be a starter or just wnat to join in as pit crew or something?" Thanks for the invite Paul, but a East African Rally may be closer. Bathurst would be great, but I have one more eastern state trip coming in January, a family wedding. I've done three east coast trips already in the last twelve months and with two teenagers in high school it's probably not going to happen. Nothing like spending 30K a year on your kids education, but they're benefiting from it. But if my fortunes change I'd be there in a flash. TargaSL wrote: Octagon (targa orgainsers ) have become rather a pain so we are not intending on running Tassy next year. Since there is no shortage of f*kwits in this world - these a$$holes are trying to shut down the April FoSC Bathurst event. Based on it's losing them revenue. April FoSC event is only $600 or so entry fee... these ba$tards charge $3500! Easter time they get 800 or so competitors and it's fun... these chumps are probably just rich farkrs with too much cash. No consideration for the people building club level sprint cars on a low budget. I think the april event should still go ahead, cause if it get's cancelled there will be about 850 drivers searching for the Trackcrop wanker. I'll be there next year........hopefully. is there some drama in who runs the event next year with the cost differences? what race format did you run? did you get any video to make a TubeFace thing? No.. there's 2 different events. 1 later this year and 1 in April next year. Though the event later this year run by Track-corp is trying to get the April event (which is the club level event that's cheaper and you need a Level 2S for) cancelled.. cause it's cheaper than the track crap one. If they get the April event (run by FoSC) cancelled.. Bathurst looks to lose a truckload of revenue and there's a lot of people that will be gearboxing the driveway of the head of Track crap. Got vids, I think you're a subscriber to my channel of tubeface awesomeness. Scope it out.. OR you can go to youtube and search for "better than billerwell" and it'll come up. Guys, quick question, it's hard to tell from the FoSC website, for the April event, what are the requirements, car and driver wise? Is it no roll-cage? CAMS licence required? I'm certainlt dead keen to get there with the 026, just need to start planning now if there is anything I need to get in place. If roll-cage IS required then I'm probably a no-go for participating, but will come and watch. Fotografa wrote: Guys, quick question, it's hard to tell from the FoSC website, for the April event, what are the requirements, car and driver wise? Standard CAMS Level 2S requirements.. no roll cage required. Street registered cars will get less scrutiny. If not road registered they grill it more. It's like any other supersprint event really.. CAMS L2S, Approved Helmet.. FIA approved Fire proof race suit, gloves etc.. and Fire extinguisher.. the supp regs and all that come out closer to the date - but yeah.. just like any other. Cost last year was $600 odd per entry (with 6 man team). And pit hire garage was.. .can't remember will have to look up.. think it was about 500 or so for 1 garage which is basically 100 per person. And you can fit at least 4 cars at a time in there. Or 10 trabi's. It's technically about time consistensy being a regularity relay.. but once you get on the mountain you just wanna put in the best time you can. Think this will make for a new thread.. I'll start a new one to get interest moving for April. Man that sounds awesome. I'm gonna start saving now. A CAMS Level 2S (S being for speed) licence requires nothing more than being a member of any CAMS affiliated club and filling out the form and paying your money. I get my L2S through Thornleigh Car Club simply because I've been a member there for over 30 years. I could get it just as easily through the Classic Rally Club of which I am also a member. On the subject of CAMS licences, there is also a cheaper version, a L2NS (for no speed). That one will allow club motorsport that excludes speed events (supersprints, lap dashes, hill climbs, etc). For the under 18s (juniors), CAMS also have cheaper licenses, a L2NSJ (which they can get at age 12) and a L2SJ (which they can get at 14).